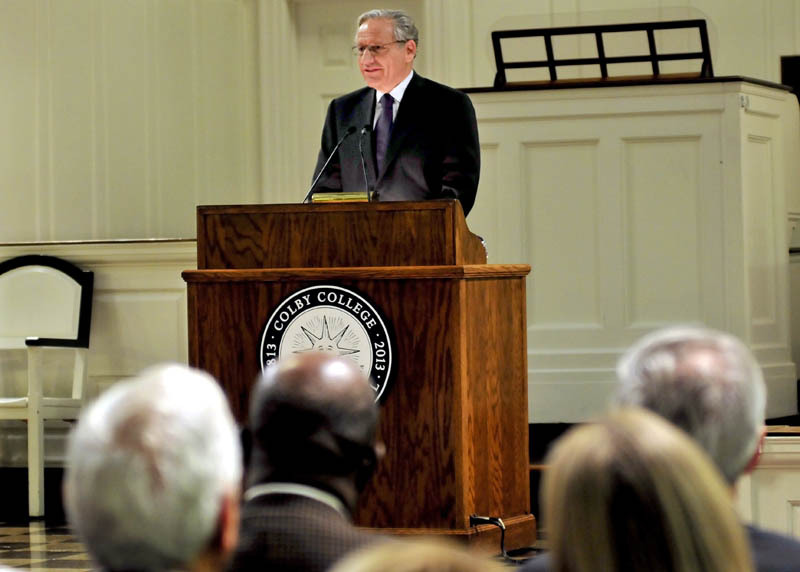 WATERVILLE -- Bob Woodward, who initially rose to prominence as a newspaper reporter for his role in the investigation of the 1972 Watergate break-in, spoke on the role of journalism in America while accepting a journalism award Sunday at Colby College. WATERVILLE — Bob Woodward, who initially rose to prominence as a newspaper reporter for his role in the investigation of the 1972 Watergate break-in, spoke on the role of journalism in America while accepting a journalism award Sunday at Colby College. The award is named for Elijah Parish Lovejoy, a Colby graduate and journalist who was killed in 1837 for condemning slavery. It has been awarded annually since 1952 to individuals demonstrating courage in journalism. Woodward deflected the idea that he was courageous in revealing the corruption of the Nixon White House to the world. He noted that in many countries, such as Russia, journalists face serious threats of reprisal, including assassination, from repressive governments. Woodward said journalism plays an important role in shedding light on the actions of public officials. Woodward also spoke about the appeal of the profession. Woodward, an associate editor of The Washington Post, also has published 17 nonfiction bestsellers. His most recent book, “The Price of Politics,” was released in September and dissects the behind-the-scenes negotiations between President Barack Obama, U.S. House Speaker John Boehner and other congressional leaders, who failed to strike a deal on the national debt ceiling in 2011. Before Woodward’s speech, a panel of journalists moderated by Stephen Engelberg, managing editor of ProPublica, spoke on investigative journalism in the digital age. The panel included Colby graduate Matt Apuzzo, 2012 Pulitzer Prize winner for investigative reporting; 2008 Pulitzer winner Jo Becker of The New York Times; Martin Kaiser, editor and senior vice president of the Milwaukee Journal Sentinel; and 2000 Lovejoy recipient Bill Kovach, of the Project for Excellence in Journalism.